I found myself today thinking about how life used to be for me when I let my shyness control how things worked out. 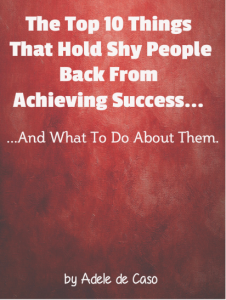 I used to let my shyness really get in the way of what I wanted from my life. I always knew deep down that I wanted to be a success at something, and maybe have my own business, but I never had the confidence to actually pursue anything. I remember having several jobs whilst at college and university, but I didn’t enjoy any of them. One of them was working in a new pet superstore, I actually found the products and learning about them really interesting, but this was spoiled by the fact that I felt trapped working for someone else, being told how long to take for lunch and when I could take holidays. Also, I didn’t enjoy working with a lot of people, I was soon labelled as the quiet one which I hated. When I had finished my course at university, it wasn’t long before I got a full time job at the local hospital, working in the laboratory. Again, being stuck in the building for 8 hours a day made me feel trapped. My shy personality made me feel uncomfortable and I was so scared of making mistakes. I remember sitting in the car on the car park for as long as possible in the mornings before work started, so that I didn’t have to spend any longer than I had to in the building. I did make a handful of great friends at the hospital, but I only ever felt comfortable in their company, and they were just a fraction of the people who worked there. I worked there for about 5 years and then something happened that was to change my life forever. I received a call at work from my now husband to say that he had found us an opportunity where we could make money in our own business. My eyes lit up and my first thought was that maybe I could leave my full time job! I couldn’t wait to get home to see what he was talking about. To cut a long story short, we started our own little business that night with a home shopping company. It was September 1996. The plan was to work it part time until it was paying us enough to leave our jobs. I was so excited, this felt like it was what I was meant to do, work for myself. I somehow felt much more comfortable already. It wasn’t easy at first, the new business involved talking to people on the phone and visiting them to show them a presentation! How on earth was I going to do this with my shy personality. I felt scared, but somehow I wanted to prove to myself that I could do it. I had lots of help from the person who had introduced us to the business and, with practice I slowly learned how to calm my nerves. I took baby steps. It was in joining this business that I became introduced to personal development, and I have to say it was a defining moment in my life. My life was different from this point. I immersed myself into reading the books, listened to the audios in my car and became passionate about learning. I urge you to become passionate about personal development too. I am sure that many of you who are reading this already are, and you too can already see the benefits. I have a tip for you today, and that is to take from personal development what resonates with you at this moment in time, and come back to the rest at a later date. If you are having to force yourself to read or you are not really enjoying what you are reading or listening to, find something else. Sometimes we are just not ready for it and when we return to it at a later date, it will be easier to digest because we have grown as individuals and are ready for a higher level of learning. 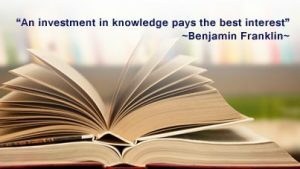 Make time in your life for personal development – it will pay you massive dividends. This entry was posted in Blog, Uncategorized and tagged learning, Personal Development, Shyness. Bookmark the permalink.